I am using Gale Gands croissant recipe to practice. The recipe level is ranked difficult (I would say that the croissant is an 11 out of 10 on the difficulty scale) and it is especially difficult if you haven’t had the benefit of culinary school traning or a lesson from a good chef. I got a lesson from a chef who not only had great style but also had a whole lot of patience. If you are looking for a challenge, this is the perfect one. Lesson I: Weight not measure your ingredeints. I would suggest that you set aside an entire day. Yes, my lesson was for 6 hours and it could have easily gone longer. In our lesson, we started by making a “Poolish” which is not included in this recipe in which you attempt to just get the basic techniques down. Just as information, the purpose of the preliminary phase called Poolish is to allow for a rapid multiplication of yeasts, which leads to an increase in the strength and rising ability of the subsequent dough. The most important thing I learned is to keep everything as cold as possible. You should work the dough as quickly as possible so the butter does not melt. And for anyone who does not love doing weights, this recipe gives you a great upper body workout. Taking your anger out on an innocent slab of butter is an experience I should have learned 18 months ago. A few passionate wacks and you’ll never need an anger management class ever! Wow – this was certainly better than therapy. 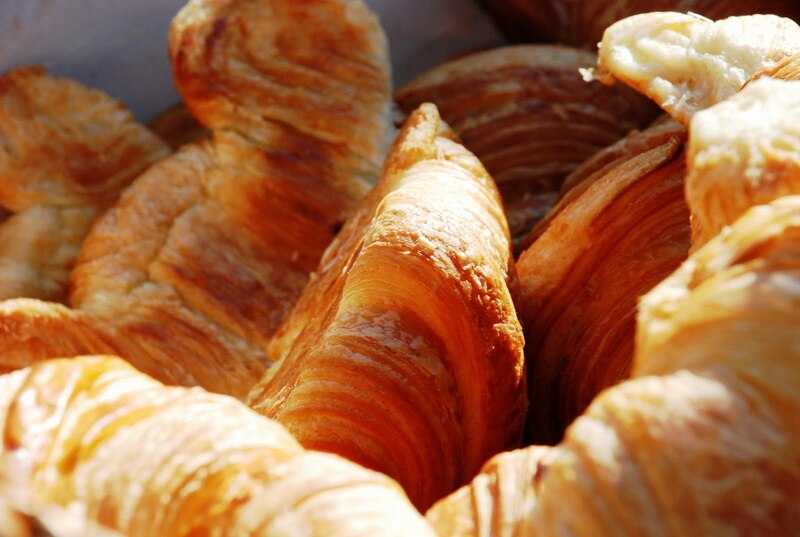 On a final note, if you’re going to cheat and eat a good croissant, make sure you make it a great one! In a mixer with a dough hook, place the yeast, flour, sugar, salt and the milk and mix for 2 minutes until a soft moist dough forms on the hook. If most of the flour isn't moistened with this quantity of milk, add more, a tablespoon at a time until it is moistened and smooth, using up to 4 tablespoons. Turn mixer on and mix for another 4 minutes until smooth and elastic. Do not over mix. Turn the dough out of the bowl onto a floured board, cover with a damp tea towel and allow it to rest for 15 minutes to relax the gluten. Remove the towel and, using a French rolling pin, roll the dough into a 10 by 9-inch rectangle 5/8-inch thick. Wrap in plastic then chill for 1 hour and up to overnight. Ten minutes before the dough is done resting in the refrigerator, prepare the butter. Place it in plastic and beat it with your rolling pin on a floured surface to soften it and form a rectangle 6 by 8 1/2 inches. Place it in plastic wrap and set aside. Continue rolling the laminated (layered) dough to form a new 10 by15-inch rectangle, patching any holes with a dusting of flour where butter may have popped through. Fold into thirds, like a letter, brush off any excess flour and mark it with an indentation made by poking your finger once at the corner of the dough meaning you have completed the first "turn". Wrap well in plastic and chill 1 hour and up to overnight. Do this again three more times (some people only do 3 turns total, some do 6, some do 3 plus what's called a "wallet" turn for the last one which is a 4 fold turn that's folded into itself like a book jacket) marking it accordingly each time and chilling in between each turn. Roll out the dough and cut it with a sharp large knife into 6-inch strips then cut them into triangles, 4 inches wide at the base of the triangle (or for a more curved croissant cut the triangles 6 inches wide). Cut into the wide end of the triangle with a slit about an inch long. Stretch these triangles again 9 inches long, then place on the work surface. Roll the triangles starting at the wide end, pulling back the dough where you cut the slit, and place them 2 inches apart on a parchment lined sheet pan with the tip tucked under and the ends slightly curved in to make a crescent shape. You may freeze the croissants at this point, or, in a small bowl, whisk together the egg and milk and brush the croissants with this egg wash.
Spritz a preheated 425 degree F oven with water, close the door, and get the croissants. Place the croissants in the oven and spritz again, close the door and turn the oven down to 400 degrees F. After 10 minutes, rotate your pan if they are cooking unevenly and turn the oven down to 375 degrees F. Bake another 5 to 8 minutes until golden brown. After trying this recipe a few times, you will get the technique but the frequent “turning” of the dough and lamination does take some practice. This recipe is also different from the one I was taught because we only turned the dough 3 times and this calls for a 4th turn. I also read a review by one woman who swore that a 5th turn made all the difference in the world. You be the judge. I guarantee that once you have mastered this, you will be ready to try any other recipe for baking with a whole lot more confidence.